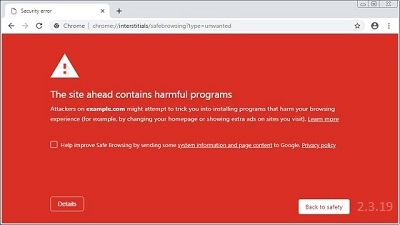 Google is adding a new feature to Google Chrome that will warn users about similar, or lookalike, URLs that a user may visit thinking they are going to the normal site. This feature is designed to warn users when they visit typosquatting domains, IDN Homograph Unicode attacks, scams, and phishing sites. In the current Canary builds of Chrome 74, a new experimental feature has been added that will alert users that they are visiting an URL that may be pretending to be or acting as a "lookalike" to a legitimate URL. For example, URLs like appl3.com, tw1tter.com, or m1crosoft.com. When users go to these URLs, Chrome will display a warning under the address bar stating "Did you mean to go to [ url ]?". For example, you can see that when we tried to go to the appl3.com URL it asks "Did you mean to go to apple.com/?". By default, this feature is only available in the Chrome Canary builds for Chrome 74. To test the lookalike feature, you can download Chrome Canary and enter chrome://flags into the address bar. At the Experiments page, search for lookalike and then change "Navigation suggestions for lookalike URLs" to Enabled. You will then be prompted to relaunch the browser as shown below. A new Chromium Gerrit post indicates that these lookalike warnings may be moved to their very own browser interstitial instead. Chrome uses interstitial pages to display warnings to users before they actually visit the requested site. Read the whole story on OUR FORUM.